TimeClockeShop.com highlights and spotlights industry news for Coding and Marking. 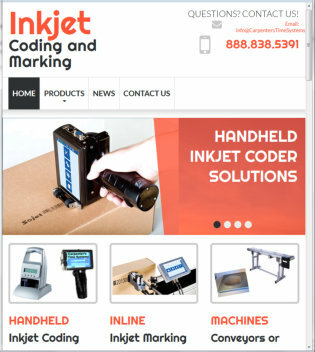 Based on many customer request, our parent company has released InkjetCodingandMarking.com, which is a new mobile-friendly website resource for Inkjet Coding and Inkjet Marking equipment. Companies and Contract Marking firms can now shop for and locate useful product information on a Handheld Inkjet Printer or Inkjet Coder to provide a professional appearance of Lot Numbers, Expiry Dates and Product Logos or Barcodes for parts and primary or secondary product packaging. TimeClockeShop.com highlights and spotlights industry news for Medical Community. Based on many customer request, the Reiner Inkjet Marking company has released the innovative Pocket Printer for Medical Forms. 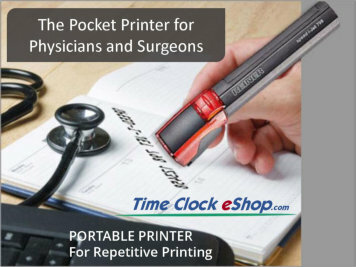 Physicians and Surgeons can now eaily validate Surgery Orders and any Medical Forms handled with an accurate Time and Date Stamp, using this innovative Portable Printer for repetitive inkjet printing. TimeClockeShop.com highlights and spotlights industry news for Document Security. 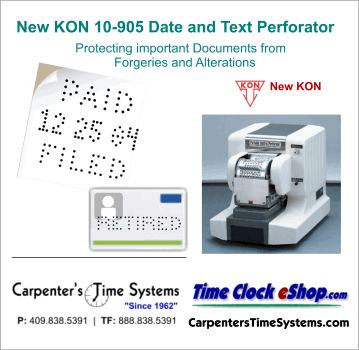 Prevent Forgeries or alterations to your firms legal documents with the New Kon 10-905 Perforator, that perforates Date, Text and Numbering. If you require an affordable and compliant method to properly Retire governmental employee credentials, choose the Widmer P400 Retired Perforator. Federal Buyers, Casino Operations and an American Embassy or Insurance Company can benefit from these machines.